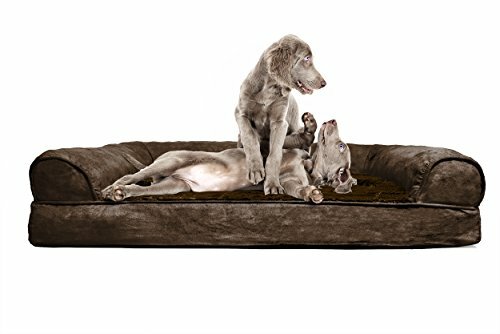 Perfect for pets young and old, the Deluxe Plush and Suede Sofa-Style Orthopedic Pet Bed is designed to provide your loved one with maximum comfort for a good night’s rest. With a soft, plush faux fur sleeping surface your dog will be more snug than a bug in a rug on his oh-so-cozy sofa dog bed! The cuddly bolstered design is purrfect for kitties as well, making the comfiest of cat beds. The orthopedic foam base supports your pet’s joints and pressure points making this pet bed ideal for arthritic pets who have trouble getting comfortable. They’ll love the suedine bolsters soft but supportive feel provided on three sides giving them a variety of cozy positions to snuggle into. The bolsters are a great pillow for your pet to lie their head on or, for pets that like to cozy into your couch, they can snuggle close to the sides for a sense of security and warmth. With the feel of a couch, your pet will love having their own space to curl into while you’ll love having your favorite spot on the couch back! No more unwanted pet fur and scratches on your furniture. It’s great for older pets who may be unable to jump on the couch and have had to lie on the floor. The sofa-style orthopedic pet bed provides the comfort of a couch without the struggle of getting up there! For your pet, we have four sizes so that you can make sure your pet has enough room to fit their preferences for maximum comfort. With a removable and washable cover, this sofa bed is easy to clean! Features water resistant polycanvas base to protect your floors from accidents. Sleeping has never been so enjoyable for your pet in this deluxe sofa style orthopedic bed. Your pet won’t need to count sheep to fall into a sound asleep on this cozy bed! Colors: Espresso, Clay, Gray, Deep Pool Sizes and Dimensions: Small – 20″ x 15″ x 3.5″ (sleep surface – 15.5″ x 12″) Medium – 30″ x 20″ x 3.5″ (sleep surface – 22″ x 15.75″) Large – 36″ x 27″ x 3.5″ (sleep surface – 27″ x 22″) Jumbo – 44″ x 35″ x 4.5″ (sleep surface – 32″ x 29″).